Scooter, as we have named him, was taken in to the rescue in June of 2003. 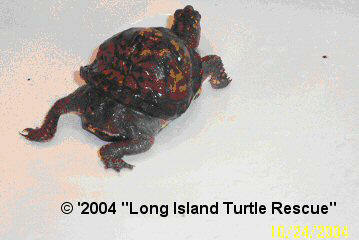 The person who had found him as a quarter sized hatchling in 1998 kept him as a pet for five years. 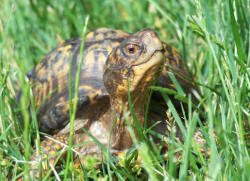 The condition he was kept in was not suitable for a box turtle. 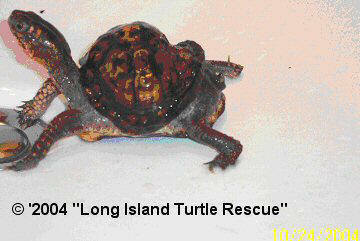 He was kept in a 10-gallon aquarium on reptile bark, which was kept in the person’s office on his desk. He was given a water dish for drinking, but not soaking. 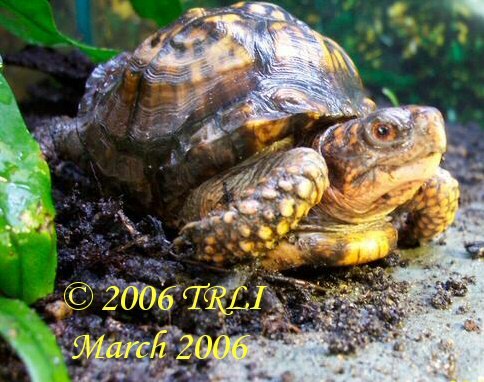 There was no uvb lighting and he was fed only processed box turtle pellets. 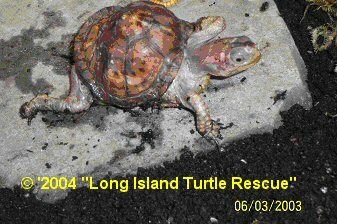 When the turtle was surrendered the person wasn’t even sure that what he had was a box turtle and thought he may be a little deformed. As you can see from the picture little Scooter is quite deformed. 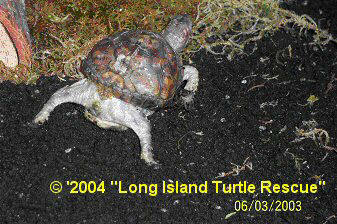 His shell is saddled and skirted all around. In the bottom picture you can see how his tail was absorbed into his little body. He has no functioning hinge and will never be able to live anywhere but in captivity. His legs were like toothpicks and his nails all curled in different directions. 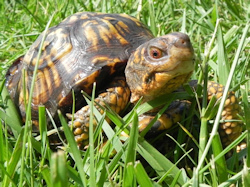 Since Scooter has been here he has been on a good diet of worms, crickets, pill bugs, slugs, fruits and greens, and kept in adequate conditions for a box turtle. His skin has thickened, it’s no longer transparent looking and his legs although not normal by any means now have some strength and have fattened up. He has even gotten a little nub where his tail should be.